One aspect of Lord Krishna’s enigmatic persona and manifestation which distinguishes him from all other deities is his leela. This divine play which makes him both human and divine at the same time becomes him most of all. Delighting in play he endears himself and brings joy to all his devotees. Krishna is a deity worshiped across many traditions of Hinduism in varied perspectives. While many Vaishnavas recognize him as an incarnation of Vishnu, some consider him to be the source of all manifestations of God. Sri Radha, His consort is the source of all shaktis or feminine manifestations of cosmic energy. Lord Krishna was the highest incarnation of the great Vishnu, the Purna Avatara. He had all the sixteen Kalas or rays of the Lord and was a noble scion of the illustrious Yadava dynasty. The world-teacher, He is the supreme lover toward whom his hungering devotees are passionately drawn. His dharma as Vishnu’s avatara is to spread joy and delight, destroy the demonic forces and reveal the nature of time and duty to Arjuna on the battlefield of Kurukshetra. Krishna is often portrayed as a baby, a youth playing the a in the tribhang mudra or a youthful prince revealing the nature of time and duty to Arjuna in the Bhagavad Gita. The principal scriptures discussing Krishna's legends are the Mahabharata, the Harivamsa, the Shrimad Bhagavata Purana and the Vishnu Purana. In Sanskrit Krishna literally is used as a name to describe someone with dark skin. Krishna also stands for the "all-attractive one". Krishna is the 57th name in the Vishnu Sahasranama, meaning blissful according to Adi Sankara. Mathura, Almighty Lord Krishna’s birthplace is far superior to the mundane world and beyond earthly attachments; abounding in spiritual bliss, because Lord Krishna manifested in the prison to display his loving tenderness by spreading joy and delight. The main purpose of the Lord’s incarnation, lucidly explained in the ‘Bhagwad Gita’ is for the salvation of saints, destruction of evil and installation of righteousness. Towards the end of the Dwapar Era, Atrocities were on the rise, religion had become a mere farce and all deities were in great pain. Krishna belonged to the royal family of Mathura, and was the seventh son born to the princess Devaki and her husband Vasudeva. Mathura was the capital of the Yadavas and king Kansa, Devaki's cousin, had ascended the throne by making his father, King Ugrasena a captive. King Kansa had imprisoned Vasudev and Devkiji, terrified as he was of his own death, having killed six of their earlier children. Devaki's apparent miscarriage was transferred to Rohini as Balrama. The seventh child was to be the Lord Himself. The nakshatra was Rohini, the planets were at peace with the stars twinkling. Precisely at that moment the Lord was born resplendent with a conch, discus, club and a lotus. Vasudeva believed Krishna’s life was in danger and secretly took him to Gokul to be raised by Yashoda and Nanda. Attracted by Gokul the instant Lord Krishna was born to spread his love and joy reflects his immense love for this celestial land where the delights of Paradise are reflected as if by a cosmic mirror onto the fields, forests and streams of the region. Balrama his elder brother (Devaki’s seventh child transferred to Rohini’s womb) and Subhadra (daughter of Vasudeva and Rohini also survived). 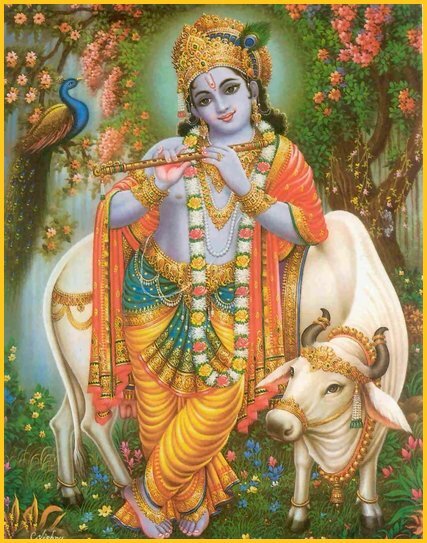 Ved Vyasji Maharaj describes the child play of Krishna or Gopala in the ‘Shrimad Bhagavatam’ and Soordasji recites that child Krishna pesters his mother for the moon, thieving milk and curd from complaining neighbours. Highly revered by Shri Shriman Mahaprabhu, Vallabhacharyaji, Shri Chaitanya Mahaprabhuji, Shri Vithal Nathji, Shri Sanatanji and several acharyas, this many-splendoured land attracts hordes of devotees till date. Shri Giriraj is the most fortunate of all the mounts in the world since Lord Krishna is forever wandering on its slopes. Lord Krishna admonishes the people of Vraj not to become a prey to ritualistic Vedic worship but engage instead in a more humanistic dharma of love. Shri Giriraj is extremely fortunate because Lord Krishna lifted it on his little finger for seven days at a stretch to protect Brajwasis from the fury of Indra’s devastating rain. Followers religiously circumambulate the mountain on Purnima and Amavasya with several ascetics and saints residing in its lowlands. The mellifluous sound of his flute draws Sri Radha and the gopis, out of their homes in a romantic dalliance with Krishna. More than a musical instrument; the flute is the breath of love and a call to eternity. The lowlands of Shri Giriraj has been the prime devotional site of ashtachap kavis (eight Krishna poets who lived in Goverdhan during the later sixteenth century) all said to be disciples of Shriman Mahaprabhuji and Gosai Vithal Nathji. Lord Krishna is construed as the quintessential romantic hero with tenderness and teasing and the beauty of his dark body, enflaming the desire of the individual soul for union with God. The Lord is revealed as a supreme lover towards whom the enraptured village girls with whom he sported in his youth are passionately drawn, revealed Shri Naradji in the Bhakti Sutra. Lord Krishna makes us cross a new threshold of awareness that he exists intensely in our hearts when we sing his praise and dwells in our longing for him, giving rise to kam or passion which is pristine and pious in the earthly dialect. The gopi bhava is love and pristine kam, the zenith of spiritual awareness. The undivided whole that is God requires the absorption of its parts to be restored to wholeness once again. Gopivallabha or beloved of the gopis is one of Lord Krishna’s epithets. Udhavaji says that so steeped in the love of Krishna are the hearts of the gopis that while others may only aspire to reach the state of oneness with the Lord these simple cowherdesses have already attained it. Lord Krishna and Shri Radhaji are in essence a single entity who manifest as two distinct individuals for the sake of interpersonal romantic exchange. Arising from his heart, Shri Radha is Shakti, the Godhead in female form. Happy in her beloved’s joy, Radha above all the other cowherdesses and all other souls of the world, ultimately emerges as the supreme object of Krishna’s passionate love. Shri Krishna and his parikar (attendants) Shri Radha and her sakhis were incarnated in Braj to delight their devotees. An idyllic landscape is Vrashbhanupur where madhurya or sweet love unfolds. We can not savour the romantic sentiment without the beloved as love requires not only the self but equally the object of love for its expression, which is Kishori Radha. Lord Krishna enchants the world but she enchants even him. Radha is acknowledged as the supreme deity for she controls Krishna with her love and perfect spiritual life is unattainable without her grace. Nandgram is the village of Shri Nandraiji who dwelt here. Highly revered by Vaishnavas the place invokes their devotional service. The Bhagavata posits Lord Krishna as the paragon of sweetness and gives him epithets such as madhukarya or madhupati. Loving tenderness, lyrical softness, innocent pranks, beautiful adornments such as the vanamala, all add up to the madhurya of Lord Krishna which defines his love. Let us venture towards Nandgaon, enchanted by this perennial quest for Lord Krishna. Krishna’s life is filled with both dangers and delights. Having killed the demonic forces which continually attack the area, defeating Devraj Indra, now the Lord in Shri Nandraiji’s Bhavan delights his parents, gopas and gopikas by his innocent pranks and winsome manners. Lord Krishna’s youthful career was spent in the guise of a cowherd among the simple people in the region of Braj. One of his epithets is Govinda or leader of the cows. The present day Vrindavan with Shri Yamunaji, pilgrimage sites and idyllic landscape is a temporal reflection of the eternal Vrindavan in Shri Golok where God forever dwells. Here the divine enjoys himself in romantic dalliances with Shri Radha without the restrains of divinity in the most beautiful setting of pastoral Vraj and its wilds. His amorous frolics with the gopis of Vrindavana became known as the Raas-lila and were romanticised in the poetry of Jayadeva’s Gita Govinda. Vrindavan reveals Lord Krishna as a supreme lover towards whom his hungering devotees represented by the enraptured gopis with whom he sported in his youth are passionately drawn. This search of the impassioned soul for union with god is centered within the earthly Vrindavan, the celestial region or perhaps that region in the heart where god is ultimately found. Leaving The Idyll of his Youth Behind, Krishna Goes on to Fulfil his Dharma as Vishnu’s Avatara on this Earth. On his return to Mathura as a young man, Krishna overthrows and slays his evil uncle Kamsa. Reinstating Kamsa's father, Ugrasena, as the king of the Yadavas He becomes a leading prince at the court. During this time span he comes close to Arjuna and other Pandava princes, his cousins. Lord Krishna reveals the nature of time and duty to Arjuna on the field of Kurukshetra as told in the Bhagavad Gita. The pinnacle of Krishna's strength was tested in the Mahabharata war which deals with practical questions of politics and battle. The Pandavas and Kauravas were cousins who had been torn apart by politics. The five Pandavas, their mother and wife Draupadi had lived in exile in a forest, cheated by their uncle. When they returned after exile to ask for a small piece of land to rule over, they were denied. This led to a nationwide battle fought in Kurukshetra. Arjuna, on behalf of the Pandavas, chose to have Krishna on their side, while Duryodhana leader of the Kauravas opted for his army. It was during the war that Arjuna broke down, unable to fight his own brothers any longer. He asked Krishna how he could possibly kill his own relatives. Precisely then Krishna assumed his true cosmic form as Vishnu. Arjuna was so scared of this spectacular sight that he begged Krishna to return to his original form. Krishna said that dharma was supreme and we, as humans, could control only our karma or actions and not its consequences. He said that whenever there was excess of adharma or unrighteousness he would take birth to rid the world of evil. He endorses that only those who sincerely worship Him and come to Him alone for protection would attain moksha or salvation. Interestingly, Krishna also affirms that he is greater than other men and warns them not to emulate him for, "I am not like you." This is in complete contradiction to Rama who considered himself equal to all men. Krishna's wise teachings bore fruit, as the Pandavas defeated the Kauravas with his help. Ruling a kingdom in Dwaraka, surrounded by luxury, eight queens and 16,108 wives, Krishna establishes his own kingdom. Following the war Krishna lived at Dwaraka for thirty-six years. Then at a festival, a fight broke out between the Yadavas, the only class of warriors left after the Mahabharata War, who exterminated each other. His elder brother Balrama then gave up his body using Yoga. Krishna retired into the forest and sat under a tree in meditation. While Vyasa's Mahābhārata says that Shri Krishna ascended to heaven, in Sarala’s Mahabharata, He dies from the mistaken aim of a hunter. Krishna's disappearance marks the end of the Dwapar Yuga according to Puranic sources and the start of Kali Yuga, dated February 17/18, 3102 BCE. Ramanujacharya and Gaudiya Viashnavas hold the view that the body of Krishna is totally spiritual and never decays, the perspective endorsed in the Bhabavata Purana. Krishna is an important and popular deity of the devotional and ecstatic aspects of Hindu religion, particularly among the Vaishnavas. The Nimbarka Sampradaya, Vallabha Sampradaya and Gaudiya Vaishnavism perceive Krishna as Supreme God, rather than an avatara, as generally believed. The Krishna of Shrinathji is a svarupa or the living presence of Krishna, celebrated deity of the pushti marg Vaishnava tradition founded by Vallabhacharya and carried forward by his son Vithalnathji (1516-86). The Bhakti movements devoted to Krishna became prominent in southern India in the 7th to 9th centuries CE. The earliest works included those of the Alvar saints of the Tamil country. The Gita Govinda of Jayadeva in Bengal and Orissa of the12th century CE written in flawless Sanskrit becomes a landmark of devotional, Krishna literature. The work champions the robust love of Radha-Krishna wherein Radha became inseparable from devotion to Krishna. The masses sang the songs of the devotee-poets, who composed in the regional languages of India, expressing intense personal devotion. The bhajans of Mirabai and padas of Surdas epitomize Krishna-devotion in north India. Since 1966, the Krishna bhakti movement spread outside India largely due to the Hare Krishna movement the largest part of which is ISKCON founded by Prabhupada, who wrote about Krishna in English to share the Gaudiya Vaishnava philosophy with people in the Western world. The Interpretations of the term "Krishna"
The word has three meanings. One is: Krishyathi iti Krishnah or ‘The one who cultivates the hridyakshetra or heart is Krishna. The metaphorical search for the impassioned soul for union with god is centered within earthly Vrindavan or perhaps that region in the heart where God is ultimately found. The second is: Karshathi iti Krishnah or The one who attracts is Krishna. Krishna is nothing but madhurya or sweet love expressed by His loving tenderness, lyrical softness and mellifluous sounds of his flute. A third significance of the word Krishna is Kushyathi iti Krishna or One who is always blissful. As Krishna, Vishnu becomes a part of the human condition not just to establish dharma but to spread his joy and love. Vraja is considered superior even to Vaikuntha for it is only in Vraja that Krishna expresses his love. Unfazed even while putting an end to demonic forces and revealing the nature of time and duty to Arjuna in the battlefield of Kurukshetra, Krishna is always in a state of bliss. It was because of this trove of virtues, the sage Gargacharya named Him Krishna. Hi. Exactly as you say.